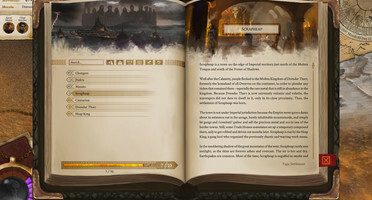 In our latest devlog (#4) Geri, the creator of the world of the Riven Realms, have shared how he got hooked on fantasy books, stepped on the road culminating in a life-time of dungeon mastering to his friends, and most importantly recounted the creation of the dark continent of Xeryn, where our game Vagrus takes place. While explaining all the sources giving him inspiration for that, you - dear reader - might have suspected already that the lore of the Riven Realms is vast and detailed. And you were right. 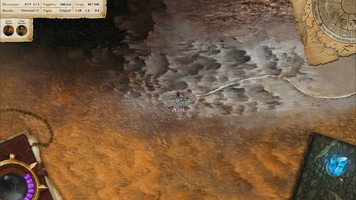 In this devlog post we want to show you how you, as a player, can immerse yourself further in that lore if you so wish. 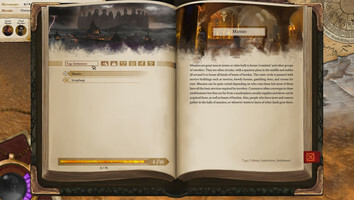 The Codex is a tool in Vagrus that lets players read up on the world, its inhabitants, locations, lore, characters, and whatever else that has an entry. The idea was to provide players who wish to know more a place to find it and to allow you to look up things you may have forgotten; but to make this absolutely voluntary. If you do not wish to read these entries, you can still absolutely play Vagrus, as this is basically additional fluff. The Codex does, however, have gameplay implications: as you gain entries through events, you gain Insight, which can be used to improve your leader or your companions. This happens automatically though, so you need not read the entries at all. Collecting all entries will be a real challenge, one that is tied into one of the possible starting ambitions of your leader. The Codex can be opened at all times and shows new entries first. Entries have tags that you can use as filters (such as locations, concepts, characters, and so on). Once clicked, entries become 'read' and you can find them below the new ones. We hope that this optional nature of the Codex will be a great solution to all kinds of players who pick up Vagrus. Let us know what you think.